MILWAUKEE — It might be time to take the Milwaukee Brewers seriously. The Brewers established season highs Saturday, producing 17 runs and 19 hits in a 17-6 rout of the New York Mets to move to 13 games above .500 and pad their National League-leading record to 33-20. The Brewers will try to keep it going Sunday at Miller Park when they wrap up their season series with the Mets, who send right-hander Zack Wheeler to the mound. Wheeler could have been a part of Milwaukee’s current success had the Mets not had second thoughts about a 2015 trade for center fielder Carlos Gomez. Doug Melvin, the Brewers’ general manager at the time, thought he’d reached agreement with the Mets on a deal that would have sent Gomez back to the team that drafted him in exchange for Wheeler — at the time still rehabbing from Tommy John surgery — and Wilmer Flores, who famously was caught crying by television cameras after learning of the trade during a game. New York backed out of the deal, citing concerns with Gomez’s medical report, and Milwaukee eventually swung a deal with Houston that landed dominant reliever Josh Hader while Wheeler remained with the Mets. Wheeler (2-4, 5.32 ERA) takes the mound Sunday for the series finale, looking to win for the first time since April 29. Wheeler has dropped three straight decisions since that last victory. He has struggled for the most part this season, posting a 6.97 ERA against all teams but the Marlins, who he has held to two earned runs in 13 innings spanning two starts. He faced them his last time out and allowed three runs (one earned) in six innings and stuck out a season-high nine thanks to an effective slider. Wheeler is 1-1 with a 2.00 ERA in three starts against the Brewers, and 1-0, 1.54 in two career outings at Miller Park. 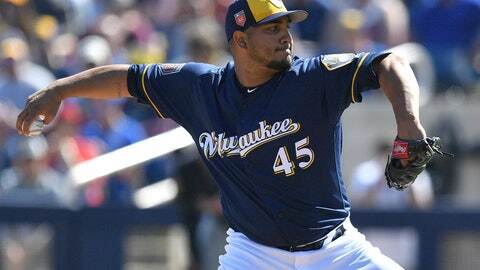 He’ll face right-hander Jhoulys Chacin, Milwaukee’s most consistent starter this season. Chacin (3-1, 3.32) took a no-decision his last time out despite holding Arizona to two hits in five scoreless innings. He’s 3-0 with a 2.28 ERA in his last eight starts and is holding opponents to a .230 batting average this season. “The first three or four starts, my fastball command wasn’t good and they weren’t swinging at my slider,” Chacin said. “My fastball command has gotten better and they swing more at my slider now. He’s 2-5 lifetime against the Mets, posting a 5.76 ERA in 10 career appearances (nine starts) and held them to a run in four innings earlier this season in a 3-2 Brewers loss.